Hey there! Before getting to the next chapter in the history of the Hand later this week, I thought we’d take a little detour to the time before there were ninjas in Daredevil. Stan Lee’s Daredevil was full of contrivances holier than the pope, and the whole Mike Murdock debacle which saw him impersonate his own twin – the one he made up on the spot out of thin air – was certainly no exception. Quite the contrary. Mike Murdock finally “died” in Daredevil #41, but since Matt had made him up back in issue #25 in order to cover a threat to his secret identity, one crucial question remained: What happened to Daredevil? Wouldn’t Daredevil die along with Mike? 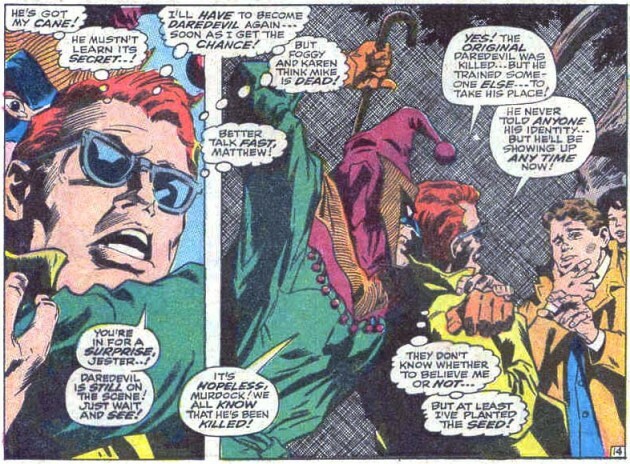 Here, in a violent confrontation with the Jester in issue #42, Matt is forced to admit that there is still, in fact a Daredevil running around. “Mike” trained a replacement, you see. Do Foggy and Karen just buy everything Matt says? Please, end these lies! Many of the stories in the early DD were really poor. Even Stan has limits, but Gentleman Gene’s art remains outstanding and still cuts it today. Oh yeah, so much of it was just nuts. But you’re right about Colan. I love how well he captures tension and movement in his art and the look is so iconic, truly outstanding work. Ha! I don’t think I knew about this Mike Murdock business. I just came across this blog recently, and I love it! I’m enjoying reading your thoughts on new DD and learning about old DD. Hey, and welcome to the blog! Come to think of it, you may have been better off not knowing about Mike Murdock. The whole things was, well, weird.